Come kick off the summer with me! Visit one of Philadelphia’s most famous attractions for the Twilight in the Gardens multi-sensory series. Experience the Magic Gardens after hours from 7-10pm with guided art workshops making jar lanterns and casual mini-tours of the grounds, with featured live musical performance by Avi Wisnia starting at 8pm. Guests are encouraged to BYOBBS (Bring Your Own Booze, Blanket, and Snacks) to get comfortable and enjoy the music among the mosaicked labyrinth. This event is likely to sell out, so reserve your tickets today! 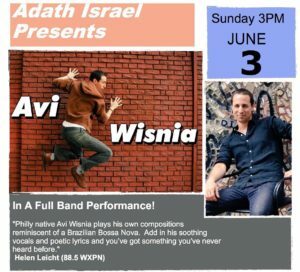 Mosaic cultural arts program at Adath Israel features Avi Wisnia & Ensemble in the community concert event of the season. This concert includes 2 full sets of music with intermission, plus a meet & greet reception to follow. Special ticket prices for reserved seating and VIP packages available.